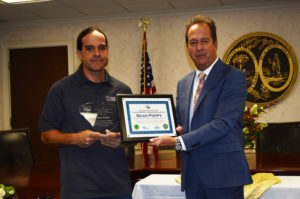 Sean Poppy, outreach program coordinator at UGA’s Savannah River Ecology Laboratory, has been awarded the South Carolina Environmental Awareness Award. David Wilson, the acting director of the South Carolina Department of Health and Environmental Control, presented the award to Poppy at a recent ceremony in Columbia, South Carolina. Poppy conducts more than 300 presentations a year to educate the public about the natural ­ecosystems of South Carolina and Georgia, ­including wildlife. His animal-featured presentations reach nearly 40,000 individuals, including students and K-12 educators.